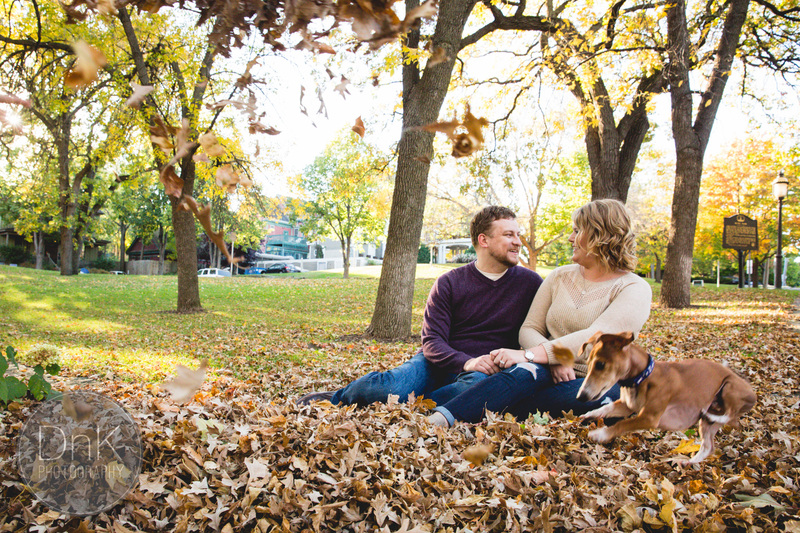 We love incorporating pets into couples engagement photos. 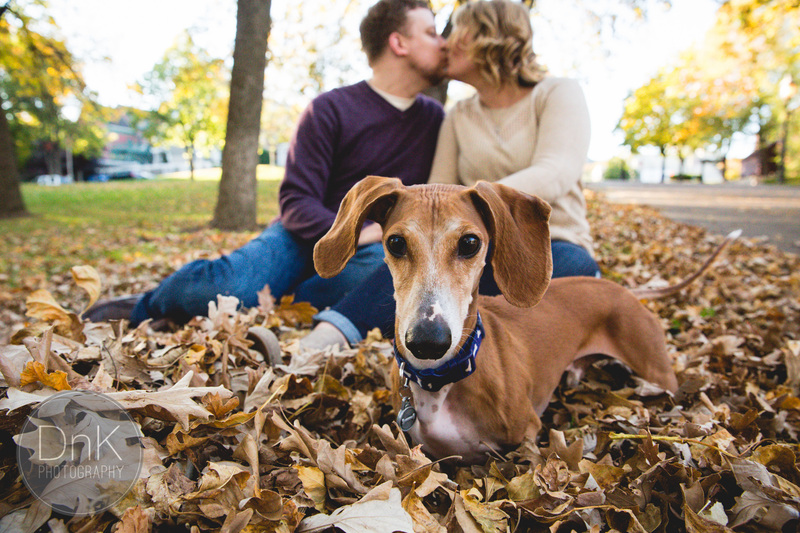 If you scroll through our engagement photography gallery you’ll see a few more : ) For a lot of people pets are family, and so it’s only natural to include them in engagement photos. 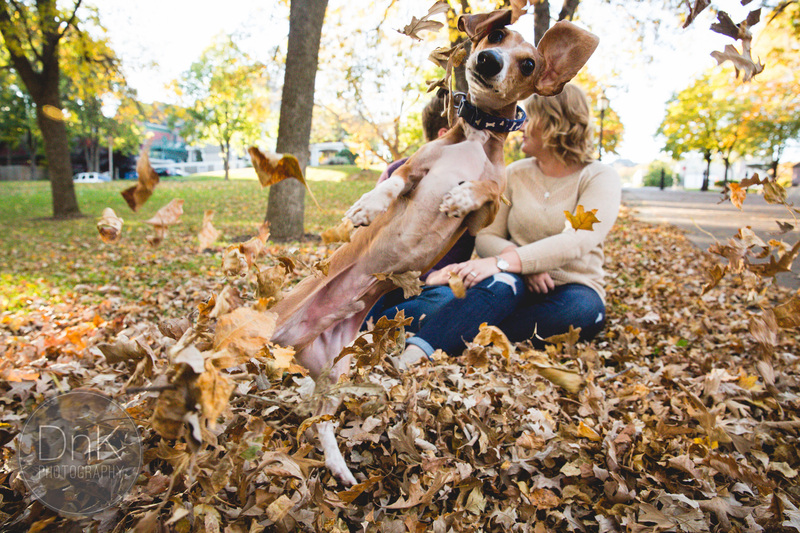 We’ve taken a lot of sweet, fun and wacky photos with dogs, but Louie took it to another level. 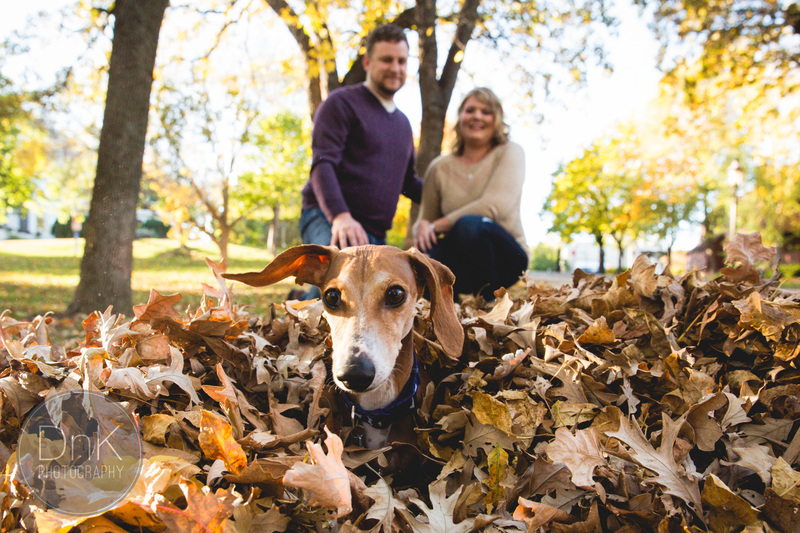 Megan and Chris mentioned that Louie enjoyed playing in the leaves, but I wasn’t quite ready for HOW MUCH! 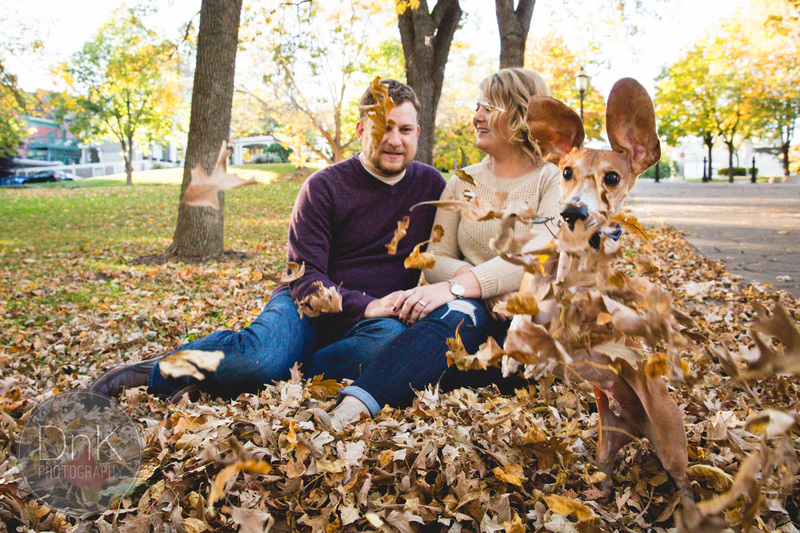 I was hoping for a fun photo of Louie playing in the foreground of the photo with the couple looking at him, but Louie launched himself right in front of the camera totally blocking Chris out of the photo. Turns out this isn’t the first time Louie has photo-bombed Chris, and Megan is starting to suspect a little bit of jealousy haha. 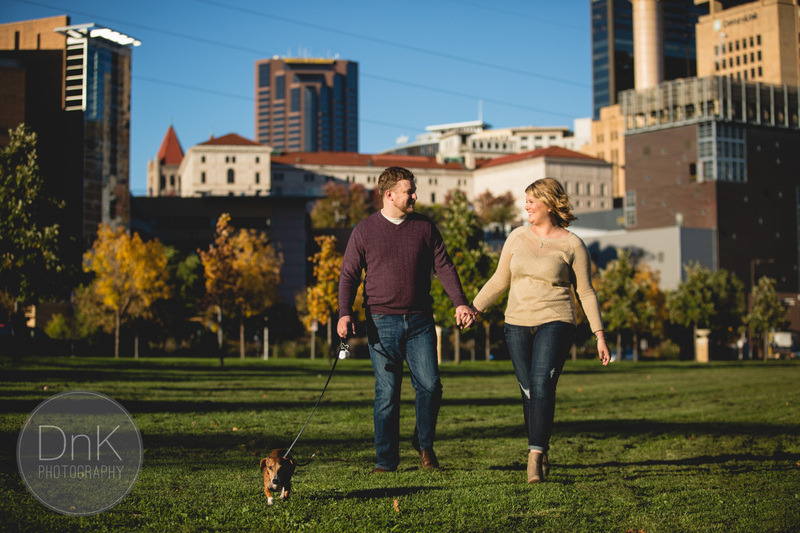 Here are some more fun Louie photos from their engagement session. OMG!!! Best photos EVER! Thank you so much for sharing these with the rest of us. Fabulous photography and such a once in a lifetime shot. This made my day. Louie RULES!!!! 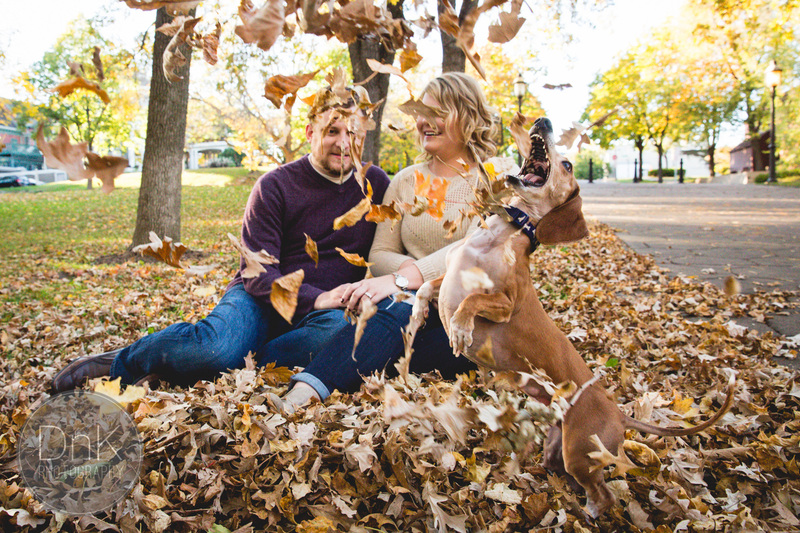 Makes me wish I lived close enough to schedule a shoot with my fur kids. Thanks again. Congratulations on this GREAT set of photos! That dog is hilarious, and it looks like they have a pretty good sense of humor about him. Saw this on ABC news’ Facebook page. These photos just brightened my day! So incredibly adorable! Amazing job! I saw the pictures so many times, I can’t get enough of them! Loved that you kept shooting! 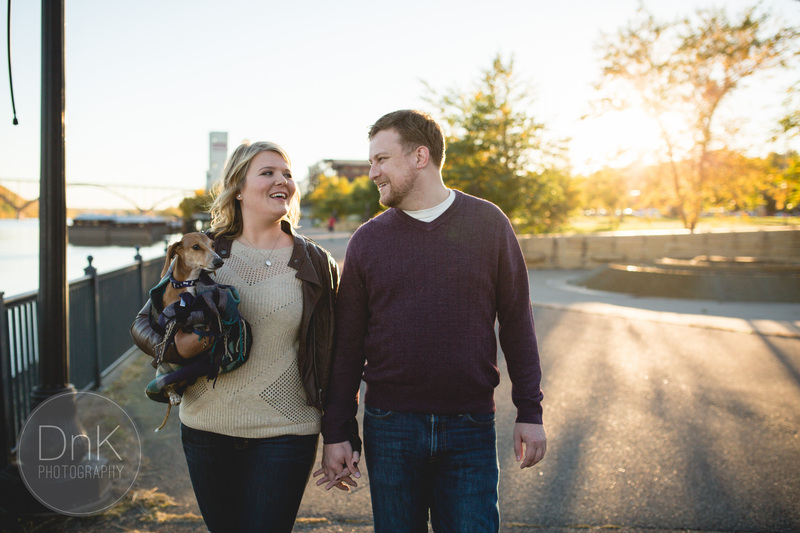 You gave this couple the best pictures ever. 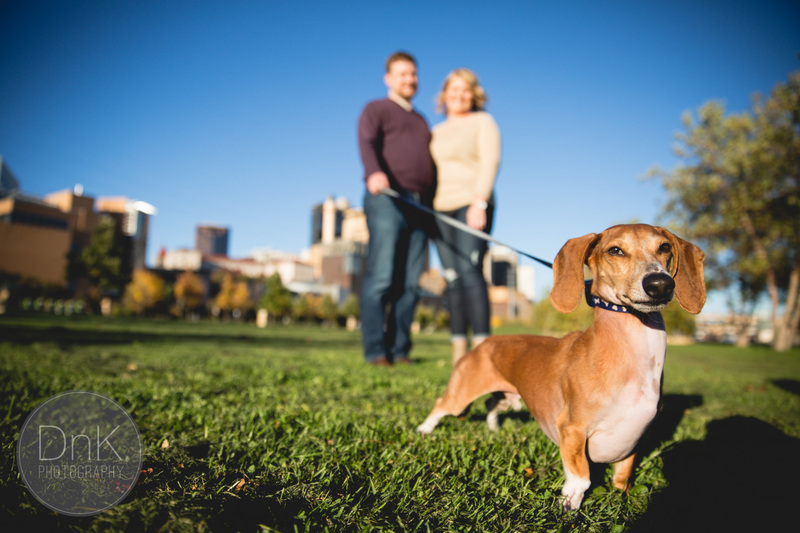 Very generous of Louie to share his photo shoot with you! Louie MADE those pictures into something very special. Whatta cutie he is & quite the ham! Wow! Brilliant. These pics shows so much fun and love. I picked up your story from a Dutch newspaper and had to take a look at your Blog. I really love the pictures! Louie has such an adorable face, he just put a smile on mine! 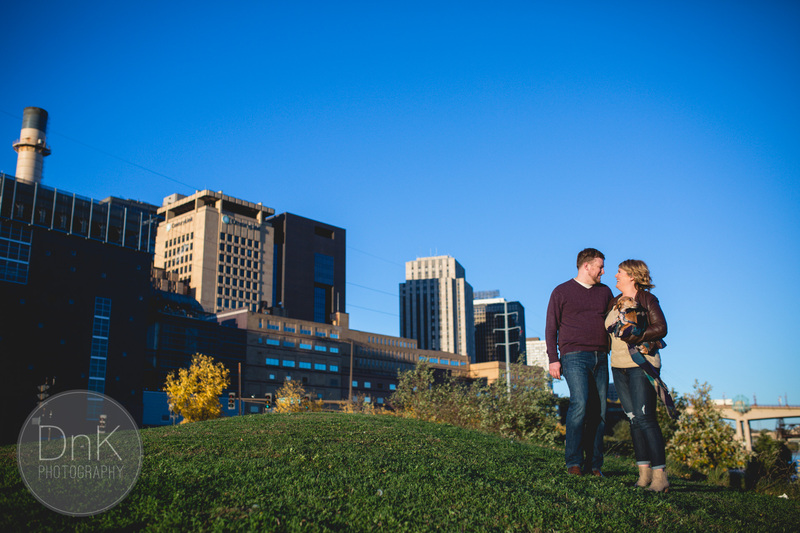 Congrats to Chris and Megan on the engagement, this shoot will be one that they’ll never forget and it will put a smile on their faces every time they look back at it. Amazing job, thanks for sharing! These pics made my day! Pain in my belly from laughing, this is great. The dog is hilarious. This makes me so happy !!! Lovely !!!! How fun! These photos cheered me on a rough day. OMG I laughed until I cried. Thank you so much for sharing. These photos are a scream!! I would like to introduce Louie to my beagle Yoda who rules our house the same way I am sure he does. 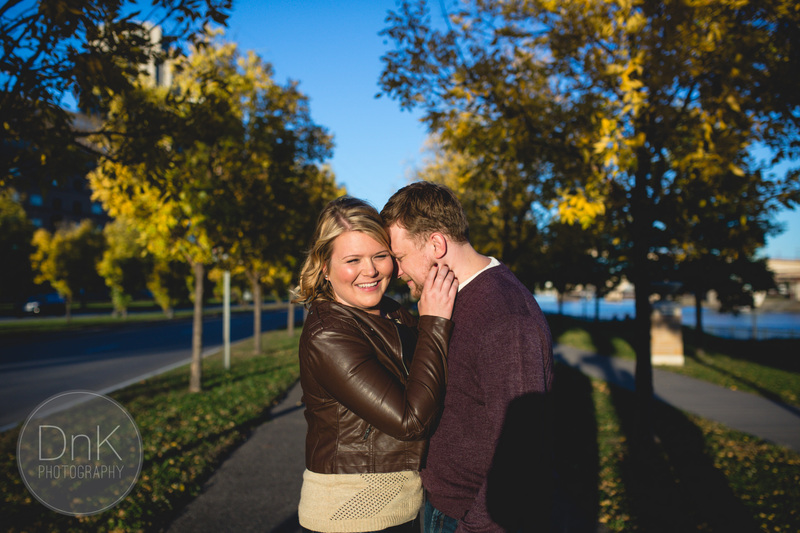 I cannot wait to see wedding photos with Louie center stage! Sooo cute!! With all the respect, the couple is just a detail! Wishes from Brazil! Just looooved it!!!! He’s soooo cute!!!!!!! Loved it! Best wishes from Brazil! 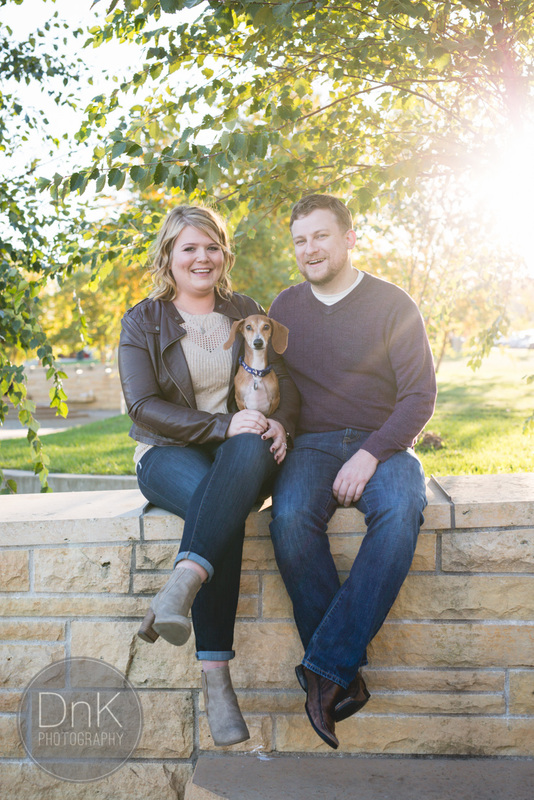 Well wishes to the happy couple and their, clearly, happy puppy! The shot of him on the extended leash and all proud and happy with himself is the best one.. That smile says it all. Megan and Chris WHO??? I have eyes only for Louie! Dachshunds rock! Good luck to Megan and Chris, and long and happy life to you all. Megan and Chris WHO??? These pictures are a scream! 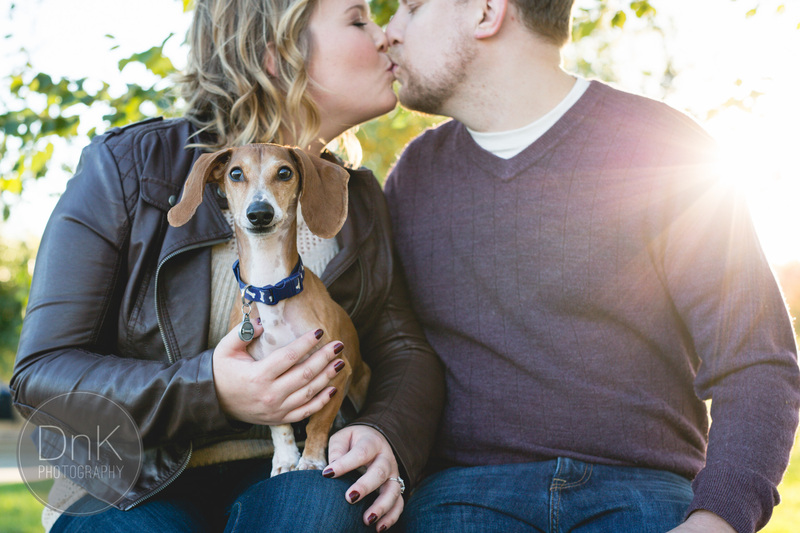 The photographer captured perfectly the typical dachshund goofy and fun personality. 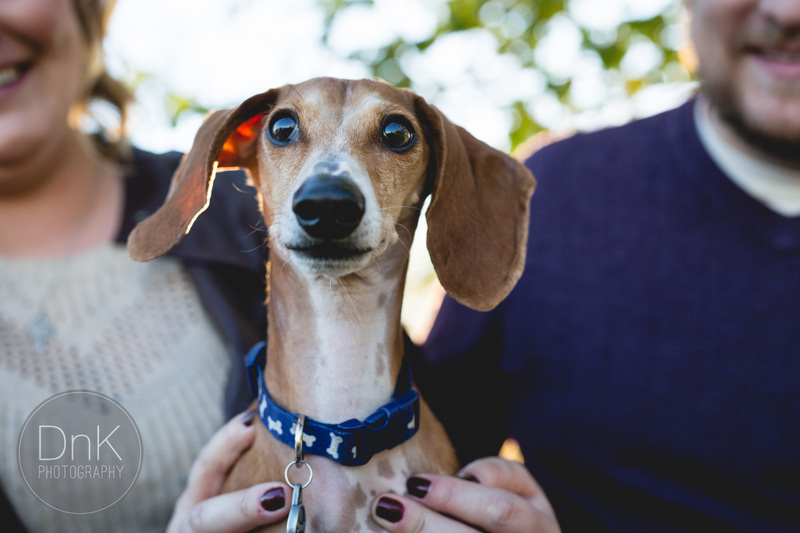 Louie (and all doxies)rocks! The happy couple now has great pictures to help them remember the day. Louie is just practicing for the catching of the garter at the wedding ! Watch out ladies ! He’s a “catch”. Best of luck for the cute couple and Louie. P.S. We have a Louie too! The only male (a terrier) with 8 basset hound sisters. He won’t let another male into the house, so we have nicknamed him “Lou Hefner”. I think it’s appropriate! These pictures are the best photos I have ever seen with a “wild wiener” in the middle of everything going on. I sincerely hope that the three of you have a beautiful and happy life together! Louie definitely showed off his athletic abilities. I have three longhairs so I completely understand his antics. GO LOUIE!!! He is 2 cute and adorable. This really made me smile. Such an awesome photoshoot. Really great shots especially of Louie. 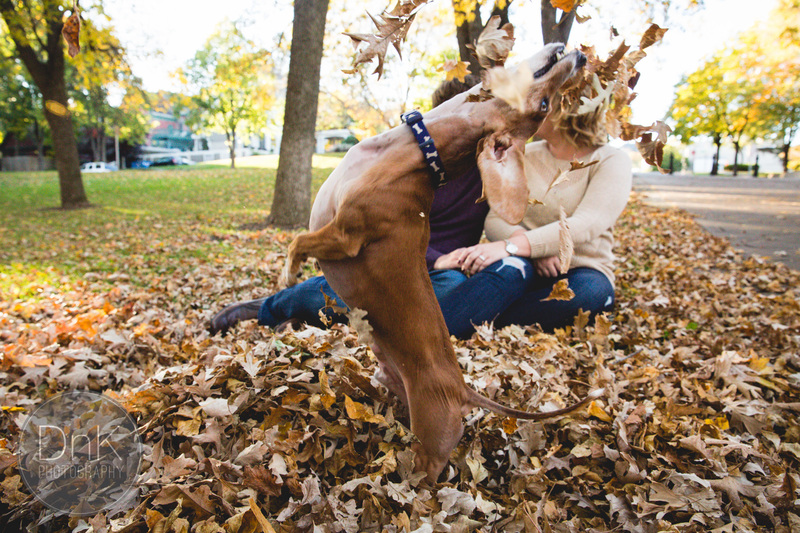 My dog does the same thing with leaves and when other people are around. Louie reminds me of Checkers, she is a clown just like Louie. it just goes to show you, we have one agenda, BUT dogs always have another-they will always be the center!!! hahaha esse cachorrinho tem uma cara muito engraçada. As fotos ficaram muito bonitas, parabéns ao profissional. Hey! I’m from Brazil and I just LOVED IT! It’s so cute! Congrats on your huge sensitivity! And thank you for sharing! Kisses! I just happened upon these & I have laughed for the last 15 minutes & shared it with my co-workers. I even shared it on my FB page. I am a photographer in Georgia. What a great way to make us smile!! !